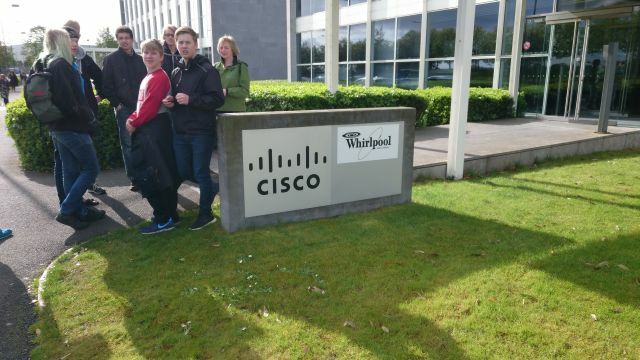 The group of 22 students and three teachers visited Cisco on 7 May 2015 as a part of an excursion to Dublin to experience both work-related and cultural subjects. This visit was very interesting with a content that everybody, both students and teachers, experienced as educational and informative. We were welcomed by Tom Long, who gave us a thorough description of the many, varied activities that Cisco is involved in. Tom told us about the development of IT, both with a historical perspective and about IT at the present and in the future. Tom involved the students in an active and constructive discussion where they were encouraged to offer their own views on the various elements. He asked the students about the type of education they were doing, and he elaborated on the qualifications that Cisco would expect from them if they applied for a job. We had an exciting demonstration of the advanced online conference system that is employed by Cisco where dedicated employees in both Oslo, London and Galway managed to include our students in the demonstration and at the same time, answered their questions. In the first part of the demonstration we learned about some of the many possibilities that are found in such a system. We saw how such a system could detect who was talking, and how it was able to change focus through speech and facial recognition. We also had a demonstration of 3D graphics. A very informative and educational demonstration! Tom also talked about The Internet of Things as an important element in the future of IT. At this moment it is not only computers and smartphones that can access the internet. The Intelligent City is expected to be integral to The Internet of Things. We were included in a video conference with Cisco in Galway where the development of the Intelligent City is an important task. 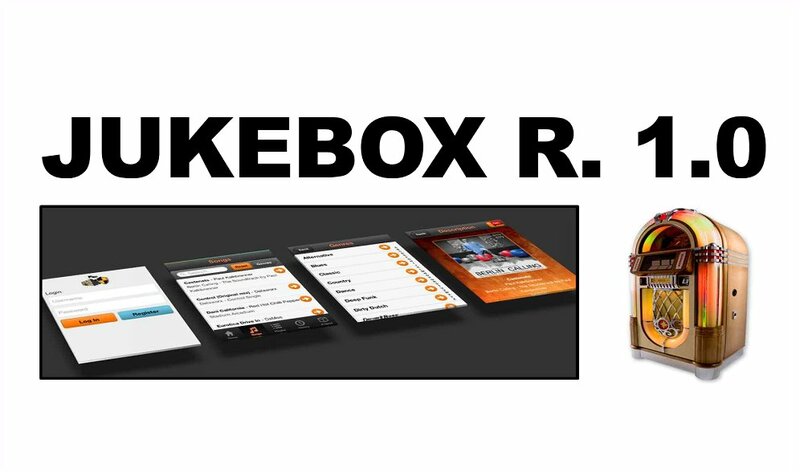 We had a comprehensive idea of the possibilities and the technology that could be a part of IT in the future. The conference showed examples of both the hardware and the software that are necessary to collect, adapt and present data in connection with the Intelligent City. Also in this case, our students were invited to participate in a discussion with the Cisco employee in Galway and were able to present their points of view and ideas on the subjects for discussion. We would like to express our thanks to all the staff members at Cisco that gave us their time and made this a unique experience for us as guests. We are very grateful for their kindness, and all of us will definitely remember this visit as inspirational. We would especially like to thank Tom Long for his courtesy and ability to engage the students in an active discussion on IT-related subjects. … without learning a programming language. Some of you might remember … the ones who came to the Cisco Partner Summit in Barcelona from 22-23. October 2014. Yes, the IoE Workshop “Be Creative with IoE: building a smart thing” where we were building a smart alarm clock. 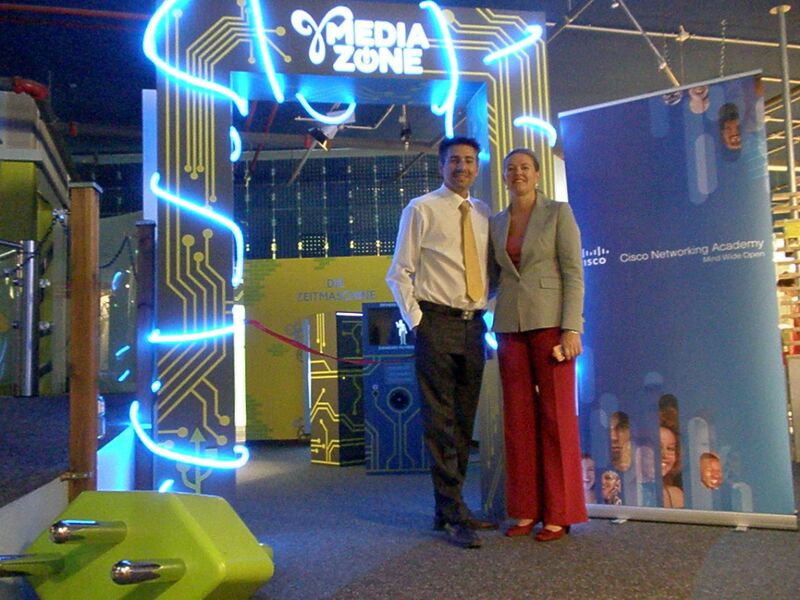 Great work, super fun and we are looking forward to IoE classrooms in the Cisco Networking Academy World. Thanks to the Technical Field Team of the Cisco Networking Academy Bogdan Doinea, Marc Khayat, Serges Nanfack Fomekong, Eugene Morozov and Giuseppe Cinque and the creators of the cool tool Wyliodrin – you can build cars or robots that can move around while your smart device is being programmed – Alexandru Radovici, Ioana Culic, Ovidiu Stoica who were supporting the teams. 10th of June 2014: lightning and storm. Bochum and Dortmund were hard to reach since their traffic infrastructure was affected quite drastically. This did not deter our young participants, who registered for the unique IT and soccer combination. They did not fail to appear for our eSkills Soccer Camp 2014 in Bochum and Dortmund the next day. Over 80 teenagers participated in the IT Soccer Camps, although the state government released a compulsory school attendance note for these days due to security reasons. Was it a good idea to join the camp in their free time? The combination of our program – learning about IT and sports combined with information about the soccer club and the stadium attracted the teenagers. They each completed three IT courses while using web tools for collaboration they had never seen before. Team work and collaboration were the topics in the sport sessions, too. The day ended with a tour through the places that would normally be filled with soccer stars: the soccer stadiums of VfL Bochum and premier league second best club Borussia Dortmund. Showcase the opportunities of IT careers to young people entering into their vocational careers. eSkills are necessary in all future career. We want to thank all contributors for joining us on this day – together we can create more impact than on an individual basis. This is the philosophy and work culture at Cisco. One of the answers to many questions we received that day about how it is to work for Cisco. We hope that we could give you insight into your possible future, inspire you and give you guidance for your upcoming career choices. Thank you for your nice feedback. Many thanks to Clemens Geyer for taking the lead, Anja Hörtner, Ulrike Egger, Markus Hatz, Anna Gillitzer, Tanja Stengg, Rosita Kashanipour, Martin Krejca, Anne Horve, Vemun Waksvik und Annemarie Hauge, Günter Herold for the great photos. Cisco Networking Academy Students in Austria like to grow their practical knowledge in projects or internships. They want to learn first hand about Networking Technology. On May 4th, 2014 , at exactly 10 am UTC the Wings for Life World Run, a unique event, a completely new competition format, never done before … happening in 35 locations at the same time, day or night … would be cool to connect with the NetAcad Team reporting directly from the global race control center in Austria? We will connect you from where ever you are with the OnSite Netacad Team to exchange thoughts and feelings. Cisco Networking Academy Students are part of this UNIQUE GLOBAL EVENT! community, check out more details and APPLY here. You can come to Austria. Do you want to be part of the NetAcad Team Behind the Scenes?